The single biggest barrier that prevents me from being the frantic book inhaler I want to be is sleep. No matter how excited I am to read my book, once I get all snuggled up and cozy, it’s just a matter of time before I nod off like Grandpa in front of the TV after turkey and stuffing. Last week I was on vacation from work and determined to use the time to read as much as possible, so I broke out the big guns--I sat in an uncomfortable chair. And through this ultimate sacrifice, I finished this delightfully dark fantasy novel! 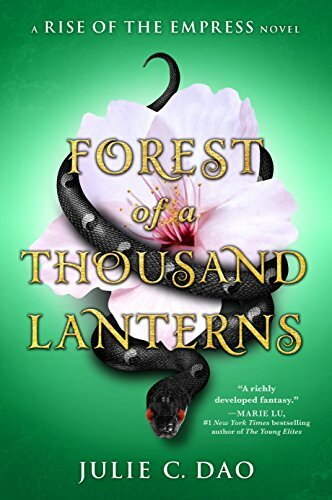 I love court intrigue, and Forest of a Thousand Lanterns is court intrigue on steroids. Add a heroine who wants power more than she wants a man, and I’ll be a fan for life. Xifeng is beautiful, but she wants to trade on more than just her looks. She has a thirst for power and prestige, and her aunt Guma teaches her to consume the power of other living things (in a really gross way, too! Like I said, this book is dark!). But what Xifeng hasn’t accounted for is that magic has its cost. Still, I’ve never seen a character more motivated to claw her way to the top, and it makes me really like Xifeng despite her at best selfish, at worst sociopathic behavior. Super glad this is the first in a series--I am definitely on board for the next installment.